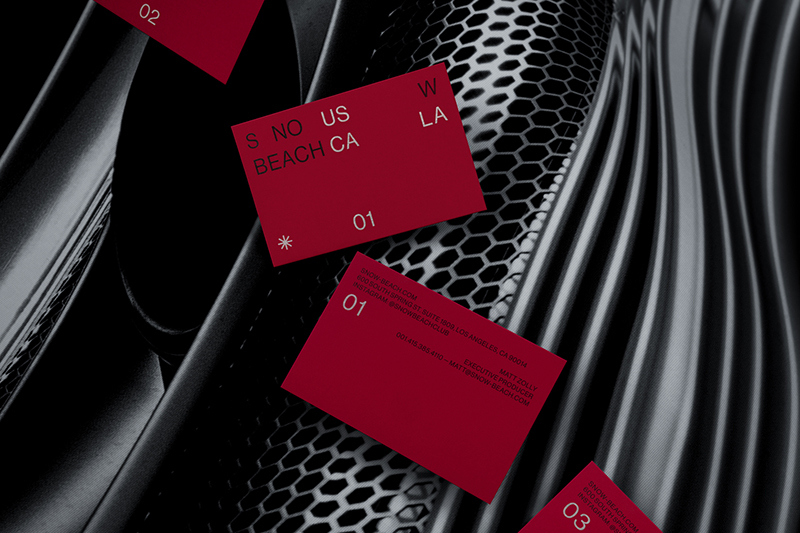 Andreas Friberg Lundgren designed these business cards for Snow Beach, a film production company that produces music videos and commercial work for well-known brands in Los Angeles, USA. Lundgren+Lindqvist worked with Snow Beach to redesign their visual identity: a new logotype, typographic system, website and stationery set. The new identity was built around a bold colour scheme with a bright red paired with pitch black and silver chrome, taking cues from Snow Beach’s own work, which is often set in dystopian urban environments. With a deconstructed typographic system, Lundgren+Lindqvist broke up words into fragments, which were intersected by geographical abbreviations and numbers, creating a coded language. A marque that shaped like a snowflake and an asterisk, is used as a building block in the deconstructed typographic compositions. These business cards were printed by Göteborgstryckeriet, in black and silver on red Plike paper, which has a rubber feel to it and is completely resistant to water. The black text is coated in a high gloss overprint-varnish smelling like burned rubber, alluding to the frequent use of spinning sports-cars in Snow Beach’s videos.